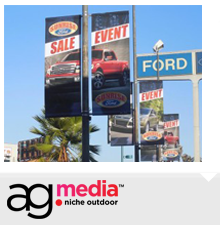 Founded in 1987 as part of the complete brand creation and implementation of The Amgraph Group, AGMedia has become the industry leader in outdoor advertising in California when it comes to City Light Pole Banners and other specialty outdoor advertising. 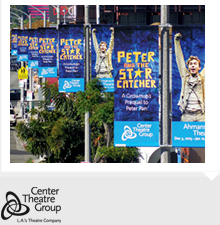 What is Outdoor Advertising in California? Outdoor advertising reaches consumers no matter what their media consumption habits are. It has the ability to go where most other media formats can’t go. It surrounds and immerses consumers out of home, where they spend up to 70% of their waking hours. It has the creative potential to break through the everyday clutter and hold people’s attention, wherever they work, shop, travel, and play. When traveling down any busy California street you can’t help but notice the varietal collection of outdoor advertising banners hanging on dozens of consecutive light poles promoting museum exhibitions, cultural happenings, non-profit events, neighborhood recognition streetscapes, and many other civic announcements. This is outdoor advertising in California and it is what we do best. We specialize in partnering with cultural, civic, governmental and non-profit organizations to offer full creative services for customizing your marketing message and campaign. 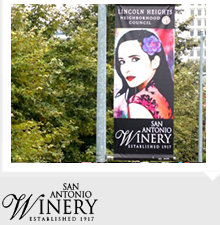 From city light pole banner campaigns, across the street banners, building banners, parking lot banners, utility box wraps, grand opening programs, window graphics and much more… AGMedia have the experience and expertise to make your outdoor advertising campaign high impact and hassle-free. Over the last 25 years AGMedia has perfected the outdoor advertising in California and many other major metropolitan areas. With our turnkey approach, quality in-house production process, and reputation of delivering results across our entire outdoor advertising product range, our success truly is yours. We provide a complete end-to-end solution with AGMedia managing all aspects of planning, design and installation including coordinating permits. 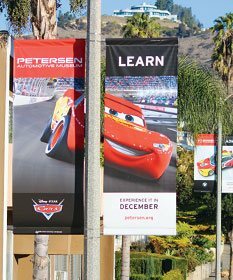 As one of California’s largest outdoor advertising companies, AGMedia recognized the need to work with vendors to make the industry more environmentally friendly. From the sourcing of materials and the use of ultra-violet curing inks in place of solvent-based inks to the disposal of banners post-use, AGMedia are employing innovative solutions to reduce their environmental impact.